The Rhine has covered two thirds of its 1320 km long trip from the Swiss Alps (canton Graubünden) to the North Sea by the time it meets a branch of the Hunsrück near Bingen. Starting here, it flows through the slate mountains of the middle Rhine region. The traveler passes through a very narrow 300m deep ravine where the Hunsrück is a natural boundary. Then he traverses the fascinating landscape of Hunsrück on his way downstream. 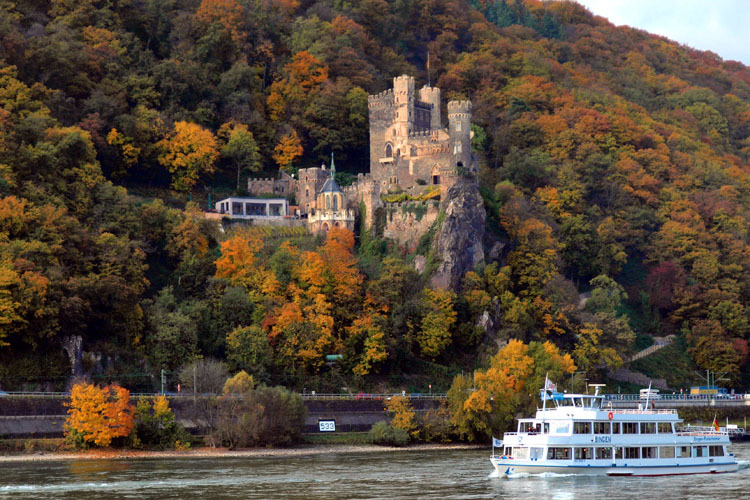 Along this way he sees world famous places such as Bacharach, Kaub, or St. Goar with the overwhelming rock of Loreley. He sees Boppard with its impressive Rhine loop and picturesque Rhens. At Koblenz, at the mouth of the Mosel in the Rhine, he has reached the most northerly point of the branch of the Hunsrück. It isn't far from here and the Rhine widens, with all the narrows left behind. The low plains now determine the flow of the Rhine to the North Sea.